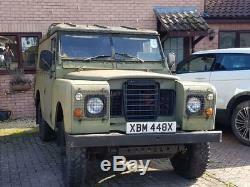 Reluctantly I have for sale my 1981 Land Rover Series 3. It's a 109 Hard Top version fitted with a 2.25l petrol engine. This is a restoration project. It has no MOT and is currently a non runner. The only reason for being a non runner is that the fuel tank needed replacing and a new one is partially fitted. Once completed, it'll run. The chassis is in good condition, it just requires a patch on the bulkhead outriggers and front dumb iron. The bulkhead does need replacing (or could be patched if brave enough). 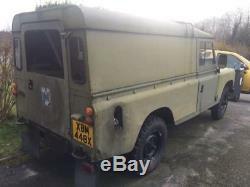 Interior is in good condition for a 37 year old Land Rover. Brand new exhaust fitted and rear cross member has been stripped and coated with CIO (buzzweld chassis in one). There is a box of spares and various parts included (mud flaps, steering damper, bump stops, axle straps, various fixings, galvanised tow step to name a few). It will need trailering away. Open to sensible offers and happy for someone to come and view. The item "Land Rover Series 3 109 LWB Hard Top" is in sale since Tuesday, November 27, 2018. 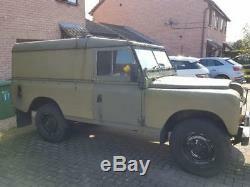 This item is in the category "Cars, Motorcycles & Vehicles\Classic Cars\Land Rover".01" and is located in Hereford.